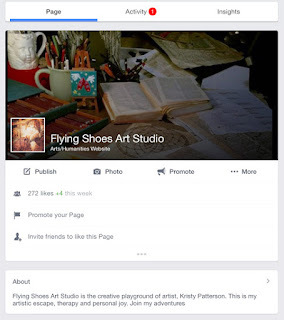 I've debated about adding any more online postings about my art studio. I enjoy this blog (which I post to rather randomly), Pinterest, and Instagram. I've tried my hand at Tumblr but abandoned that long ago. I also enjoy Twitter when I'm involved in a project, event or newstory but I'm don't read it daily. All these online resource tools can take a huge amount of time and I find they often rob me of the creative time I want in my studio. However, my recent travels have convinced me that I should create a specific page for my studio outside of my personal Facebook page. Here is a sample of one of recent Facebook posts. I really enjoy sharing my adventures online but I think my professional, studio life is better served with it's own identity. 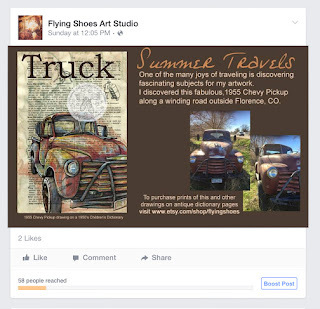 I worry that my friends get a little tired of me promoting my work and this way, they can follow that area of my life if they want to follow my studio page. I'd also like to use this method of announcing special sales, give-aways and exciting changes in my Etsy shop. Either way, it's an experiment. If you'd like to "Like" my page and see my Flying Shoes Art Studio Posts, then visit me here. I intend to get back into blogging more soon. I've been enjoying lots of projects around my house for the past few weeks and have starting preparing my classroom for the upcoming school year. I haven't spent much time in my studio but it's starting to call my name.